Salt and Pepper Shakers | Be Ready For Service! If you are “On the Floor” as I am often, at catering events you hear this request a lot. Reasons for adding salt and pepper to food include; being food snobs, old bad habits, damaged taste buds due to smoking, or a guest claims to add salt to prevent dehydration on a hot day. Some guests like the aid to digestion that back pepper provides and some simply enjoy black pepper’s savory warmth. Even though black pepper is the world’s most traded spice, black pepper usually is overlooked in the shaker — as some basic mediocre commodity on the table until something happens or a decision is made to kick it a notch or two. 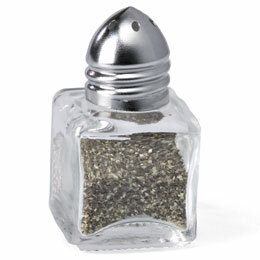 A guest removes the black pepper shaker top and tries to lightly sprinkle black pepper on their food and ends up dumping most of the shaker out – for any number of unintended reasons. Sometimes these guests want their course replaced because of the pepper dumping. Good quality table salt and ground black pepper does not belong in plastic, shiny metal bullets, aluminum mini canisters or paper packets mixed in with packets of sweeteners for coffee or tea. If you’re serving BBQ or Baja style fish tacos — OK then I’ll opt for the smaller Coronita beer bottles as shakers because that fits with food theme and decor. However in more formal service, salt and pepper shakers need to be glass or crystal, clean and polished; meaning the holes are not clogged, no water spots, food particle or smeared fingerprints from the last week’s event. Good etiquette suggests that two salt and pepper shakers be on one 60” round table — one of each shaker per four – five guests. The shakers need to in the same location on each table — say at 3 and 9 o’clock. There needs to be enough fresh salt and pepper in the shakers, so the guests don’t have to ask for more. Why Are Guests Removing The Tops Of Black Pepper Shakers? The reasons include; the shaker was overloaded, the contents are compacted from over filling or expanded grains from absorbing moisture, the shaker holes are clogged (dirty), or the ground black pepper is larger than the holes in the shaker top. We did. Here’s what we discovered and the course of action taken. I talked with the Executive Chef. We spoke at length to several suppliers and became more knowledgeable on table salt and ground black pepper. After considering options we made some decisions. Then we established some written standards and procedures to provide an above average experience for the guests, regardless of location, menu and serving staff. We wanted quality ingredients, an over-the-top guest experience and consistency at all events. As for table salt in most cases, pure anodized shaker salt is the choice. If you are going high-end or looking to truly enhance the guests dining experience consider finer (smaller) ground Kosher or mediterranean sea salt. The taste of either is cleaner and there are no additives as in iodized table shaker salt. Make sure that the salt in the shaker will pass thru the holes in the shaker top. The word “pepper” is ultimately derived from the Sanskrit pippali. The English word for pepper is derived from the Old English pipor. Black pepper comes from the dried ripen berries of the pepper plant (Piper nigrum), a climbing vine in the family Piperaceae. The plants are native to India’s Malabar Coast, where the Malabar pepper and Tellicherry pepper hail from. Tellicherry is a higher-grade pepper, made from the largest, ripest 10% of fruits from Malabar plants grown on Mount Tellicherry, hence the name. Tellicherry has just a bit more warmth, zing and earthy aroma. Currently Vietnam is the world’s largest producer and exporter of pepper, producing roughly 34% of the world’s black pepper crop. Black pepper is also grown in Indonesia, Brazil and a few other tropical regions. So depending on where the black pepper was grown will have influence on how it tastes. Check your sources and origins carefully. The French have a term for this called “Terroir” The literal translation is how the earth, water and air — the growing environment affects the taste of fruits, vegetables, meats, poultry, seafood, etc. The fruit, known as a peppercorn when dried, is approximately 5 millimeters (0.20 in) in diameter, dark red when fully mature. Although we are focusing here on ground black pepper — I’ll mention briefly about the other peppercorns. We’ll talk about using freshly ground black pepper in grinders in another blog post. 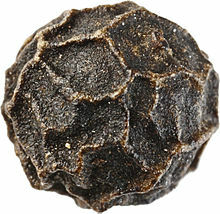 Black peppercorns: Are picked when green and dried in the sun until they turn black. White peppercorns: Ripen on the vine, the berry is fermented and its red-brown skin is removed. Be careful as some unscrupulous suppliers have been known to bleach the peppers to avoid the peeling step. Green peppercorns: Are picked while green and not yet ripe. They are then freeze-dried, dehydrated or packed in brine or vinegar. Pink peppercorns: Are the dried berries of the Baies rose plant, mostly grown on Reunion and Madagascar. The Baies plant is native to South America not India, and really isn’t a pepper plant. Black pepper like coffee is being cultivated in small batches around the world. Recently an organic black pepper crop from Ecuador arrived. Great earthy taste, however the heat intensity is just not suitable for table service. Watch for new developments as it seems closer to the equator is better for growing and more heat! Many things have been used to extend pepper, including juniper berries, pea flour, mustard husks, and papaya seeds. Check the quality carefully. Getting Your Salt & Pepper Shakers Outta’ The Weeds! Gather all the salt and pepper shakers used for guest table service. Line them all up like attentive soldiers. If you have different styles and heights, separate them and then decide on only one style. Get rid of the mismatches, obsolete units and replace with matching shakers – so all your shakers are the same. As the shakers degrade over time this allows for scavenging tops and bases as you replace providing you stick with the same design and supplier. Order some extras (back ups), as shakers have a tendency to wander off. Be sides good stylist salt and pepper shakers are not very expensive unless you go for crystal. I like smaller shakers. Smaller shakers contents are fresher and they are less obvious on the table. If you decide to get rid of all your current salt and pepper shakers spend some time looking around for a size, style, design that you like and price that makes sense and assurance that the manufacturer will be around. Once I found some great styling shakers at Ikea. A large quantity was purchased only to find out nine months later the line was discontinued. Some manufacturers make the holes in the pepper shaker top just a little larger than the salt shaker tops – check and sort accordingly. Some others add more holes for the pepper or for the salt. The jury is out on which goes in what shaker based on the number of holes. Just go with what you like. Dump out all the salt and pepper. Inspect threads on the shaker and top for spice accumulation and plugged holes. A wooden tooth pick, a stiff tooth-brush, and a small container of warm water are good for cleaning the messy threads and holes out. Inspect the glass shaker and tops. If a shaker is chipped, scratched, the top dented, rusty, or corroded replace it. Pepper and salt more so, absorbs moisture which causes the contents to cake up and not shake out – so the salt and pepper needs to be replaced at least once a quarter. In locations more humid and closer to the ocean — you need to refresh the contents more often. Soak all the shakers to loosen all the accumulations and then pass the shakers and the tops thru the dishwasher for a good cleaning. Make sure the shakers and tops are completely dry, before refilling. Now is a good time to make sure the holes are clear, as sometimes pepper grains become lodged in the shaker top holes. Polish the tops of the shakers. A soft polishing cloth composed of a cotton flour sack works really well. Bed, Bath and Beyond is a good source if you don’t have some. http://www.bedbathandbeyond.com/product.asp?SKU=14667172. There are several other good uses for the cotton polishing cloths which I will cover in another blog post. Place two grains of dry uncooked rice to the salt shakers to absorb moisture. A large wide mouth squeeze bottle or small mouth funnel with a teaspoon will make filling the shakers faster. Avoid over filling and leave some room at the top for the contents to shift when the shaker is turned over and shaken. Having a ½ sheet or hotel pan to collect the overflows and helps keep the work area clean. What ever ground black pepper you decide on must fit thru the holes on the shaker top. Get some samples from your suppliers to taste and test to see that the ground black pepper passes thru the shaker top holes. A good supplier will ask what type and size grind you are looking for. Usually pepper grinds are classified or based on passing thru a shifting mesh. Coarse dustless grind: 20/30 mesh, many people prefer this grind of pepper to the shaker grind; the slightly larger-sized grind seems to have a little stronger flavor, yet it will still fit through a standard pepper shaker hole. Be sure and check though. Dustless grind: 30/60 mesh; is a very popular ground black pepper. Here’s a great example from Penzeys Spices. Depending upon the number of guests in attendance determines the amount of shakers needed – remember budget two each for each table. Look back at your event guest counts and sort the events into size groups say 20-60, 50-120, 200, 250, 300, etc. Standardize on the shaker packing sizes. If you send an extra here and there, it’s OK. This will allow you to pack the shakers in advance, therefore not having to count them each time you go to an event. You just grab a box(s) based on the guest count and go! Get rid of the cardboard boxes. They get wet, soggy, trashed and if the shaker inside turns sideways or over — you have salt and pepper all over. 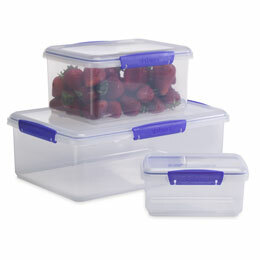 Get some airtight food storage containers like those found at organize.com (http://www.organize.com/lolofostcosh.html). These are great for transporting the shakers to and from events. Label the containers “Table Salt and Pepper Shakers” and the name of your catering company. Why “Table?” Because special interactive station-buffets set ups will be using a different types of finishing or flavored salts and peppers and you really don’t want table salt and pepper — so the “Table” designation avoids the confusion and embarrassment later. The salt and pepper shakers need to be inspected after each event and made ready for the next usage. This falls under side work and is a great way to fill time for staff waiting around for the next assignment or in between pickups and deliveries. A few minutes of inspection, top off and cleaning and polishing gets you already for the next event. Seems like a lot of attention to salt and pepper shakers. Yes, however we were surprised first by the response from the serving staff and then from guests who noticed the attention to details and for making this small aspect of service better, than before.